Here in central New Hampshire, as we step into official spring, the forecast calls for a string of 70-degree days and nights above freezing. Buds are opening up on the sugar maple trees, and the sap has stopped running. It’s time to pull our taps. The snow that held on through this nearly snowless winter is quickly melting out under the warm sun. Over the weekend, Ursula and a friend waded in the shallows opening up around the shore of the pond. Only a week ago, we skied in loops over thick, snow-covered ice, but it’s not safe to do that now. During the 14 years we’ve lived here, April 1 is the earliest we’ve been able to swim in the pond (that is, if you’re part polar bear, as Ursula and Virgil seem to be). This year, we’re likely to break that ice-out record by a week or more. 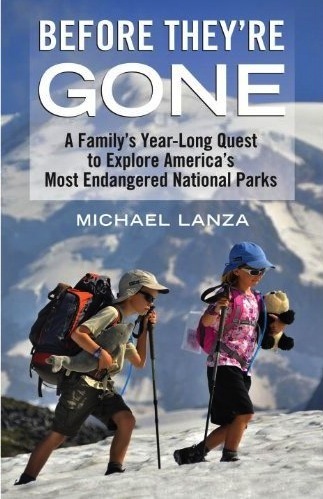 The question of climate change, and what that change means for today’s children, suffuses every page of a new book, Before They’re Gone: A Family’s Year-Long Quest to Explore America’s Most Endangered National Parks, by Michael Lanza (Beacon Press, April 3). Lanza may be familiar to you from his work for AMC Outdoors during the 1990s or from The Ultimate Guide to Backcountry Travel (AMC Books, 1999). He now lives in Boise, Idaho, where he is the Northwest editor of Backpacker Magazine. Not surprisingly, he’s brought up son Nate and daughter Alex, ages 11 and 9, to be comfortable in a tent and on a trail. In 2007, an assignment for Backpacker took Lanza to Glacier National Park, where he skied along the Continental Divide with research scientist Dan Fagre. For more than two decades, Fagre had measured snow depth and other indicators of the park’s alpine climate. Fagre’s measurements showed that the glaciers for which the park was named — 150 in the middle of the nineteenth century — were rapidly disappearing. When Lanza visited, just 27 glaciers remained in the park, most of these diminished to snowfields. “That story assignment ignited a personal interest in the impacts of global warming on the natural world,” Lanza writes in the book’s introduction. His personal interest immediately included his children: “My kids’ formative years will roughly coincide with our society’s maturation on climate change; they were born around the time that we finally began to widely acknowledge its impacts, and they will reach adulthood as we are likely to begin witnessing its full fallout.” So he organized a year-long adventure, taking his family — Nate and Alex, then 9 and 7, and wife Penny Beach — to 11 of the country’s most endangered parks. A good portion of the resulting book reminds those of us who love wild nature what it’s like to experience it for the first time. As Alex and Nate zip down snowfields and marvel at rock canyons, we share their glee and their awe. Lanza is a fine writer and an excellent observer both of nature and of family life, but he expands beyond a family adventure travelogue to chronicle the many ways in which climate change affects the nation’s most extraordinary natural places. In doing so, he has written a heartbreaking, compelling story. Lanza wisely keeps Nate and Alex out of most of the environmental science and lets them simply be kids enjoying the outdoors. Nate is fascinated by weaponry of all kinds, hoping for a chance meeting with a bear so they can deploy their pepper spray and drawing his father into endless discussions of Star Wars gadgetry. Alex insists on playing her favorite number game for hours at a time. Beloved stuffed animals accompany them on their travels. (When I spoke with Lanza earlier this month, he told me that his children were never bored in the outdoors. “They get bored at home and on the playground,” he said. On their trip, “they were entertained all day.”) It doesn’t take long, however, to realize that each new adventure introduces more distressing data. The tension between the family idyll and the looming environmental catastrophe can feel almost unbearable. Lanza makes it clear that as a parent he has an obligation to face the facts of climate change. The science tells him that his children’s children will already grow up in a very different world. But he believes that there’s still time to alter the arc of that change, to keep several generations’ worth of choices from creating a long-lasting global environmental catastrophe. Reading Lanza’s book helped me answer Ursula’s anxious question the other night. I explained that there are seasonal variations, but that yes, winter is not lasting as long in New England, on average, as it did 40 years ago, and yes, this is the result of global warming. She turned back to her homework, leaving me to sit with my own sense of unease. - Before They’re Gone will be published on April 3. Learn more about the book and Lanza at TheBigOutside.